Kim Kaufman debuting her new Choice Bank hat. Choice Bank is expanding its brand ambassador program with the sponsorship of LPGA Tour Member, Kim Kaufman. She joins Minnesota wide receiver, Adam Thielen, as Choice Bank representatives. 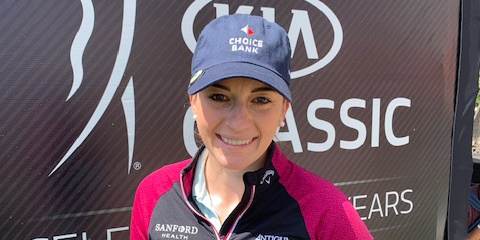 Beginning with the KIA Classic this weekend, you will catch Kaufman sporting the Choice Bank logo on her golf hat during tournament play. In addition, she will participate in corporate events, as well as select advertising and social media. Kim Kaufman, a South Dakota native, will play in the KMPG Women’s PGA Championship at Hazeltine National Golf Club, June 20 – 23.